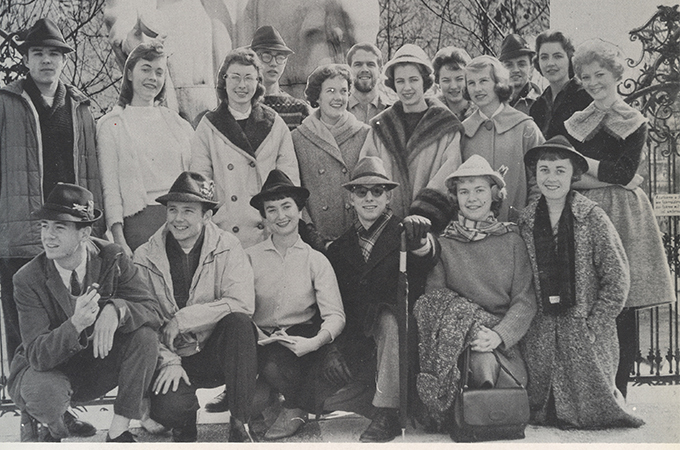 I had a wonderful opportunity in January 1960 to be among the first University of Redlands students to study in Salzburg. There were 40 students, Professor Gil Brown, Professor Edwin Gaustad, their spouses, and four young children. It was perfect for a 50-passenger bus we often used. We flew on Great Lakes DC6 to Chicago and on to New York for 10 hours, and then it was time to get on board the SS Maasdam. We were told to start reading 20 books as we crossed the Atlantic. There were classes at the rear of the ship. We faced forward, looking at the sea in a mirror behind us. For many of us, it was a rough crossing to South Hampton, England. Needless to say, we did little reading. Dottie Ellis had a hard time and spent the trip on the deck for fresh air. She ate crackers, drank water, and lost some weight. One of the best preparations for the semester was the two-year requirement of Western Civilization. It covered art, philosophy, religion, government, history, including the Industrial revolution, the Magna Carta, our Bill of Rights, war, pestilence, plagues, famines, and Ice Ages through the centuries. We did learn some German from Frau Myerhof that turned out to be quite useful, too. We visited London, Brussels, Amsterdam, Bonn, Paris, Vienna, Bern, and Rome to see the seats of Parliament and met leaders of the political parties at that time. Then there were the many hours in the churches and art museums. I recognized some of the paintings from my classes. I recall churches and museums in London, Brussels, Bruges, Amsterdam, Koln, Paris, München, Salzburg, Milano, Firenze, Turin, Roma, Bern, Genève, and others. I remember climbing the 512 steps up to the top of the Koln Dom to a magnificent view. We stayed at the Hotel Germania in Salzburg, where we looked out our windows on a church, the Mirabell Gardens, and the Hohensalzburg. As we travelled throughout Europe we learned about art, politics, culture, and history. We walked everywhere around town. We saw a peasant wedding, services at the Salzburger Dom, and the marionette theater. There were weekend individual trips to the Salt Caves, the Crow’s Nest (headquarters of Adolf Hitler), and Munich. Then there were the long weekend trips to Prague, Neuschwanstein, Chiemsee, Wien, and the Austrian countryside. As we approached Czech-Austrian the border, three fences kept the Czechs from leaving. Our bus stopped at the border, and we all got out while the border patrol searched inside, under, and all over the bus. It took two hours to pass through the inspection. We stayed in a small hotel near St. Charles Place. Precedent was broken when the waiters brought the food and BEER from the back, serving the back first and then Professors Brown and Gaustad. We were in Roma for Easter, with all the pageantry of hundreds of thousands in St Peter’s Square. Every Catholic country presented their cross to Pope John XIII. We took our bus to Oberammergau for the five-hour passion play, which had been performed every 10 years since 1633 when the town had been spared from the plague. We were sitting close to the stage. The rows behind us were covered, which meant we were soaked by the rain, but we were moved and inspired. Al Hoslett and I were the guests of the Berlin government for a weekend. We flew on a Lockheed Super G Constellation. We visited the Marienfeld Refugee Center for East Germans who had escaped Soviet-controlled East Berlin and East Germany. After going through Check Point Charlie, we toured dilapidated East Berlin. Many of the buildings on the main street were simply store fronts. It was so amazing to look at the prosperous West and the poverty of the East. The East Germans and Russians built walls around West Berlin to prohibit entry and exit. At one time the US flew in all food and supplies by DC-3s to keep the West Berliners from starving; the Soviet Union had cut off all rails. It was sometimes difficult to be away from our families—no cells phones in 1960. One day, one classmate, Marsha Dougall, received information that her father had died. The news hurt all of us. Marsha asked if I would go for a hike the next day. The hotel packed a lunch and we were off to walk in the snow of Kapuzinerberg. It was a moving day for both of us. After the semester was over many of us spent more time seeing other parts of Europe. Al Hoslett and I used a VW bug that an Oxnard friend purchased so we could drive to Barcelona, Spain, across the Pyrenees Mountains to the west coast of Spain and up the French coast. Then it was off to Denmark, Sweden, Norway, Finland, and St. Petersburg, Russia. In Russia, we were driving and had a Russian map that we could not read, when we came across a road blocked by a Russian soldier who had his rifle pointed at us. As we spoke no Russian and he spoke no English or German, the rifle told us to turn around and take another road. The first-class Russian hotel we stayed in had plaster falling off the outside, and the stores were less than 10 percent stocked, but we go to a concert that was excellent. And then it was back to California. To learn about current opportunities for U of R students to study in Salzburg, visit the Salzburg Semester web page.